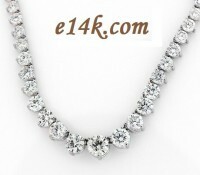 Stunning 15 Carat Graduated Round Brilliant Cubic Zirconia Tennis Necklace... Solid 14k White or Yellow Gold... Available in 16 inch or 18 inch length. Gorgeous Russian CZs!!! Top Quality, Heavy Necklace! Flashy!!! We use only Solid 14k Gold!